Image Optimization is one of the most important factors for your website run without any problems. As if the images embedded within your website wouldn’t be optimized, then they will grasp a huge bandwidth and will resulting into very heavy load laid on your website. This may let too much of traffic driven away from your website. And nobody will want that, well if you want to know that how you can get yourself away from these kind of problems by optimizing your image, then there is a simple solution to it… Just use any of the below given image optimization tools as per your desire. So, let us drive through the list. This application makes use of a variety of optimization techniques in order to provide the best quality it could generate. It determines the format and technique one should use to optimize your image. It also automatically chooses a format for the image if feels a need of doing so. PNGGauntlet is a .NET based application that makes use of PNGOUT command (Windows DOS) to optimize PNG files. As, this application is purely based on the optimization of PNG files, hence it can also be used to convert JPG, GIF, TGA, PCX and BMP formats into PNG files. Web Resizer provides you help in optimizing images for your website. It lets you to do some extra efforts with your pictures like crop, border, resizing and sharpening your images on just the click of a few buttons. Some other useful features are image rotation, resampling filters, color conversion etc. SuperGIF is a desktop application for Macintosh and Windows users which enable you in effortlessly making all your GIF images and animations smaller. SuperGIF makes out images about 45-50% smaller, and it does and a better job is done with the GIF images, which are reduced up to 80% in size. iResize is an efficient online tool which is used for resizing images for free. It enables you to reduce the size of your images in accordance with bytes and pixels criteria. It is an easy to use and completely handy application. GIFBOT allows you to compress any JPEG or GIF graphic at an instant. All you need to do is enter the URL of the graphic/image you want to compress, and multiple variations would be in front of you to choose from. You would see all the varying graphics on a page, together with the original file. PNGOUT is command line optimizer for PNG images and is available for free. The compression provided by PNGOUT is of lossless format. According to the developer of program, this very application can grasp up to 5-10% more compression in comparison with other tools. Web Graphics Optimizercan be referred as a perfect tool compressing and optimizing images for online usage. Most images can be greatly reduced in size, and it’s amazing to see how much you can improve the speed of your Web site and reduce the necessary web space. WP Smush.it is wordpress plugin (freely available) to optimize newly uploaded or existing images. It has the capability to convert the image format from GIF to PNG or remove the unwanted information from JPEG. The SiteReportCard Image Optimization tool is a freely available utility that compresses your GIF, JPEG, and PNG images. This particular Image Optimization Tool supports JPG, GIF and PNG formats. You can either upload it from your computer or paste the URL, and the tool will compress and optimize the image into various size and quality. TweakPNG is a low-level utility for examining and modifying PNG image files. So, you need to familiar with PNG file format in order to use this tool. However being a low level program, but it is still very famous with the web designers. The reason could be known by the author only. Dynamic Drive is another most popular image optimization tool. You can easily convert one image type to another using this tool. But it has a limitation that the images uploaded could only be of 300kb. However as far the functionality and the resultant made by the tool is concerned, it is nearly perfect. You can use this tool to convert or compress images into the JPEG image format. It will convert almost any image format and it will contain the best quality possible. That could be the reason for the popularity and high usage of this tool. Shrink O’Matic, is an Adobe AIR application whose over all purpose is to resize your images for optimum quality by allowing you to drag and drop in-between images on your desktop. Features and options such as output formats, output name or the output sizes are encouraged to be used. It is a really good application and must be tried once. 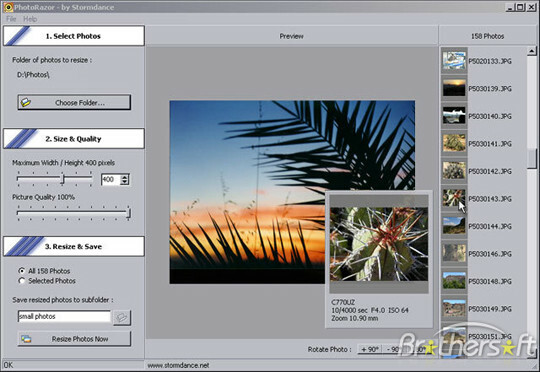 Easy Cropper is an easy and simple way for you to crop any image for use on the web. Once you have selected your photo from your computer library, all you have to do is select the desired height and width in pixels, and click “Continue”. You are then presented with a preview of your new photo which you may either confirm or edit further, and then you’re done. Resizr takes care of your online image cropping, darkening, lightening, and format conversion needs. You can even use it to resize images and post them to social media sites like Twitter or Facebook. And last, but never least, is JPG Cleaner, a simple yet powerful utility for cleaning and freeing JPG files from anything that isn’t picture data related. Common and popular programs such as Illustrator or Gimp usually write additional information into your JPG files that simply aren’t needed. Remove the image waste with JPEG Cleaner! What’s more to say except the fact that ResizeyourImage is one of the most simplist and easiet image optimizing tools that exists. The web-interface is extremely clean and easy to interact with. This application does exactly as it says, it works to strip, remove, and clean-up any unnecessary metadata that may be “impairing” your image files. Formats supported include JPG, JFIF and PNG file formats. ImageOptim is a front-end (GUI) for set of tools for optimisation of PNG/JPEG images and GIF animations. This tool is widely used all with the web designers and developers. You must also be trying this for once. PhotoRazor enables you to resize an entire folder or selected images and save the smaller version to a new subfolder. You can specify the maximum width/height and image quality, and it also offers a real-time preview that reflects size and quality settings. Shrink Pictures provides us a simple online image resizing service as simple as 1, 2, 3. Browse and select your image to resize, choose the new size for your picture, select output image quality (good, better or best), click “Resize” button and wait for the processed images to be displayed, that’s it. ExtractNow allows you to extract more than one archived file at a time, with one click of a button. Makes extracting files quicker and easier. ExtractNow supports ZIP, RAR, ACE, IMG, IMA, IMZ, ISO, & BIN archives. RIOT enables you to read and optimize different image formats by reading the magic number. So, it is able to optimize images with uncommon extensions, which makes it unique compare with other image optimization tools. RIOT will display the original and output images side-by-side, so that you can compare the quality of them easily. OptiPNG is an advanced PNG Optimizer, which will convert various file formats into optimized PNG. Windows users can integrate OptiPNG into the shell through the OptiPNG Windows Shell Integration project, or use OptiPNG as Paint.NETplugin. This was a list of a few amazing image optimization tools for you provided by us. Do you know any one which is really deserving to be here? Well, if so, then please add it as a comment and help us updating this post. Till then, enjoy image optimization with these! awesome, i really love how none of the images work. Thanks for sharing this post.I like this post.It contains 27 stunning image optimization. Thank you for mentioning the WP Smush.it plugin. Just installed. It’s a fully automatic process for compressing images on WordPress powered sites instead of doing the manual steps of uploading to the smush.it site, download compressed files, then re-upload to your site. really nice and very useful collection designers will love it !